So Facebook finally rolled out Facebook Home on April 12 for a select list of Android devices. Facebook Home adds an entirely new experience to Android. You get a new Home Screen (known as Cover Feed), integrated Chat Heads for messaging; a new way to get notified and a new way to browse your apps. We tried to install Facebook Home on a few Android devices. Google Play will allow it to be installed on specific devices only (mentioned on Facebook Home’s webpage). But for other devices, using Facebook Home seems to be a problem. Even the Facebook Home APK does not let you use the app. 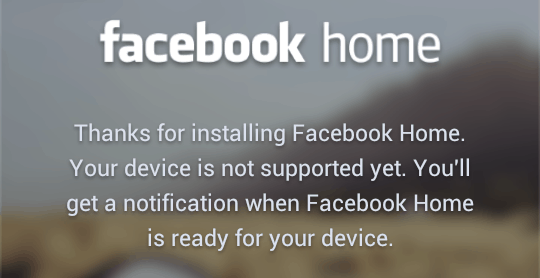 Yes, it will install; but when you run the app, it will notify you that Facebook Home is currently not supported for your device. And then there are regions where Facebook Home is not supported. So if you live in any such country/region, even if you have a supported device you’ll not be able to run Facebook Home. So how does Facebook determine which device it is installed in? One possible way might be that the application checks the device certificate to determine the device. If we could modify the APK file to disable the device check, it could work on all Android devices. Incidentally, we also found out that someone had already done it. And as for regional restrictions, Google tracks your location, so it blocks access to Facebook Home on the Play Store in such cases. A developer posted a thread in XDA Developers Forum claiming that he had successfully patched the Facebook Home and Facebook APKs to lift device restrictions for Facebook Home. And the good news is that, thanks to XDA once again, we were able to run Facebook Home on all the devices! The Facebook Home update comes in three parts. 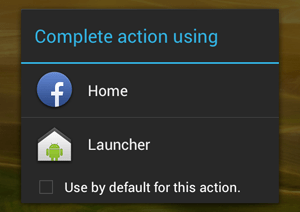 The Facebook Home App: A custom Android Launcher that integrates with Facebook. It features the all new Cover Feed and an all new three-in-one Home button. The new Facebook app: It includes new features and permissions to integrate with Facebook Home. The new Facebook Messenger app: The Facebook Messenger app now includes the Chat Heads feature, an innovative way to display new messages from your friends. Additionally, it also includes new permissions to integrate with the Facebook Home app. Go to Settings >> Applications >> Check “Unknown Sources” >> OK.
Go to Settings >> Security >> Scroll down and Check “Unknown Sources” >> OK.
3> Uninstall Facebook: The Facebook APK needs to be modified slightly for it to work with Facebook Home on all Android devices. 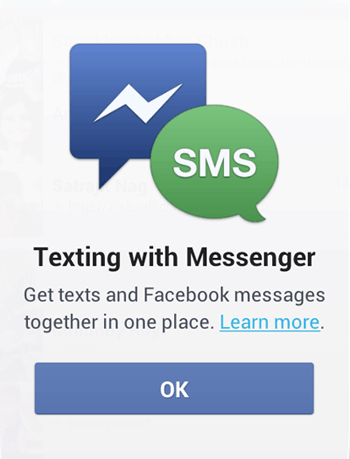 The modified APK will not install if Facebook is already installed on your Android device. Note: If Facebook comes preinstalled on your Android, you might require to root your device in order to uninstall it. 4> Download the modified APKs: Next step is to install the modified Facebook and the Home apps from the links provided below. 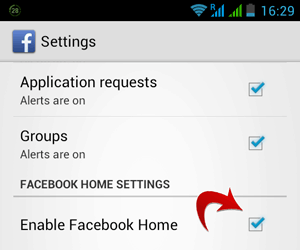 5> Integrate Facebook with Home: Follow the steps given below to integrate Facebook with Home. Launch the newly installed Facebook app and sign in to your account. Press the Menu Hard key and select Settings option. Scroll down to the bottom of the Facebook Settings Page and check the “Enable Facebook Home” option. And Congratulations! Your Android device now runs the all new Facebook Home. Have a supported device but live in an unsupported region or country? You won’t have to go through all that pain, just update the Messenger and Facebook apps from the Play Store, and download and install the Facebook Home APK and “Enable Facebook Home” in Facebook Settings (as mentioned earlier) and you are good to go! Remember that any update from Facebook may overwrite the modified APKs; so as long as your device isn’t compatible with Facebook Home, you might consider not to update any of the Facebook apps. Also, Facebook Home needs ample resources to run on your Android Desktop. So for best results, consider using it on a phone that runs a dual core processor and 512 MB of RAM.